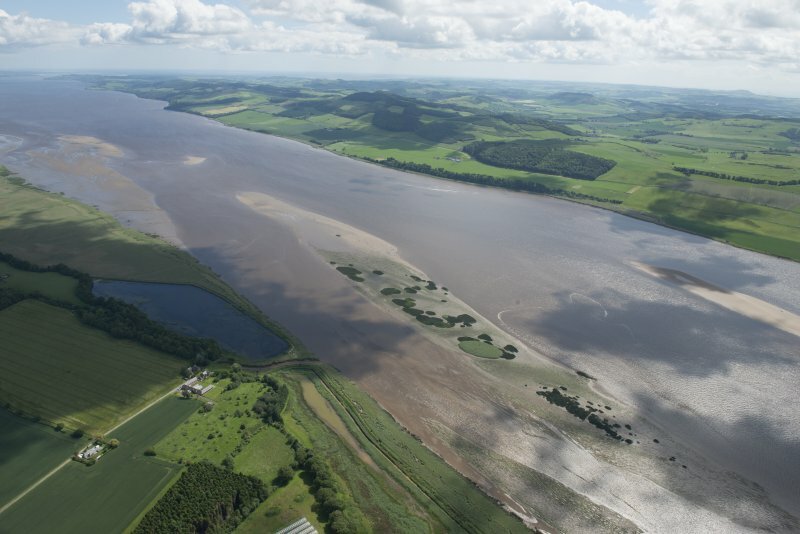 General oblique aerial view of the River Tay reed beds with Port Allen in the foreground and Fife beyond, looking ESE. OS (GIS) AIB, May 2008. Location formerly entered as NO 2506 2112. (Location cited as NO 251 211). Port Allen, Perthshire. 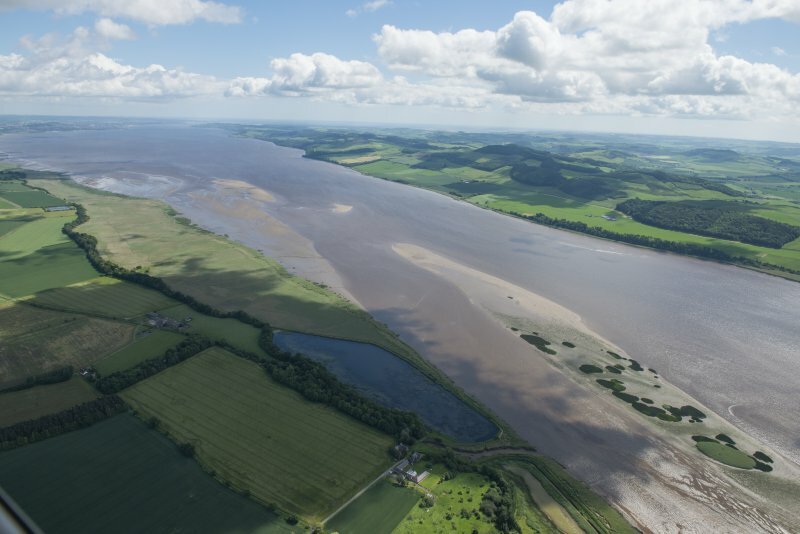 A ferry crossing the Firth from Lindores Pow is on record in 1600 and agin in 1722, a harbour ferry evidently existed before 1792, and in 1837 Port Allen, Like Powgavie [NO22NE 20], Port Allen was served by a branch road and was one of the principal local harbours. At this last date it was slightly dilapidated, but the embanking of the foreshore, which was then in progress, was expected to deepen it and improve the entrance. It occupies the mouth of the Pow of Errol, and consists of an entrance channel about 400ft [122m] long, on a northerly alignment, and an inner stretch about 300ft [91.5m] long which decreases in breadth from about 80ft [24.4m] to 60ft [18.3m] including the tidal mud. below the arch of the bridge. For some 270ft [82.3m] from the bridge, the NW side of the harbour has been faced with masonry, to form a quay. The facing-blocks are rather roughly dressed and coursed, but the inner part, amounting to about half the total length, shows much better work in its uppermost five to seven courses, and is slightly higher than the rest. The lip of this portion is likewise finished with well-squared slabs originally secured with a thin iron strap. 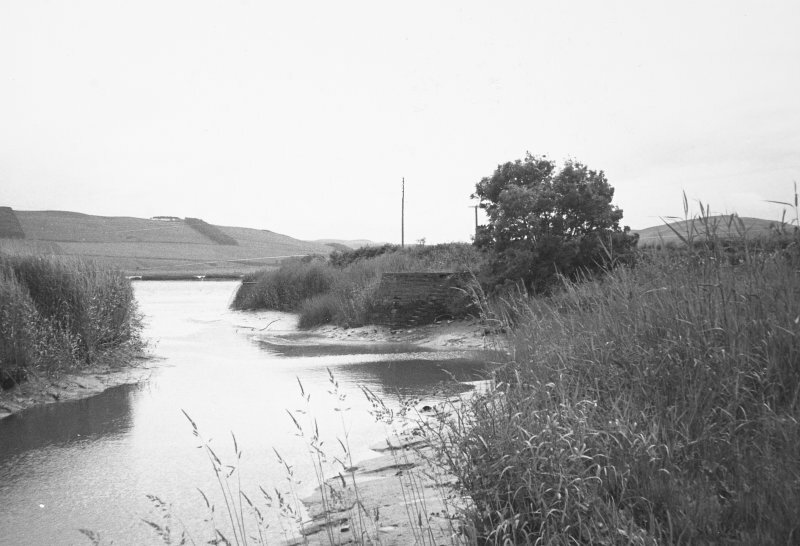 The apex of the angle between the two parts of the harbour is shown on the OS map surveyed in 1860-23 as a kind of recess, measuring about 95ft [29m] by 40ft [12.2m], but this is now largely filled up. Below the angle, but still some 270ft [82.3m] within the foreshore line, a narrow masonry pier, 30ft [9.1m] long and with a flight of steps on its inner side, projects at right-angles into the entrance-channel; it is structurally later than the foreshore embankment, against which it is backed.